In USJJF, we believe that Sharing What You Have Learned is as Important as Learning It..!! Training in Atemi Waza includes learning how to Move, Strike, Block, Kick & Punch vital targets points for most effect..
Training in Ne Waza includes learning the methods of Takedowns, Body Positioning, Locks, Holds & Chokes. Training in Leadership is a "Learn by Doing" process. 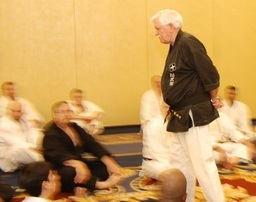 Learning the Skills of Dojo & Organizational Leadership.